It’s the weekend before Thanksgiving and I haven’t done the shopping yet so the fridge is looking a little bare today. Cheryl noticed and commented that it didn’t look like there was much to make a dinner out of, then said “but you could probably figure something out.” Indeed I could. I knew there was some ground veal in the freezer and we had some eggs so I decided to make pasta and ragu Bolognese. Normally I use ground beef but sometimes you have to work with what you have. This particular sauce is one whose recipe is debated and debated and debated and there are many different sides. Do you add milk or not? Veal, beef, pork? Don’t even get into the type of pasta you’re supposed to use (not spaghetti). A few years ago I started making my own pasta and decided I needed a proper sauce, a real honest to goodness ragu which complements the pasta well. This is one such recipe. 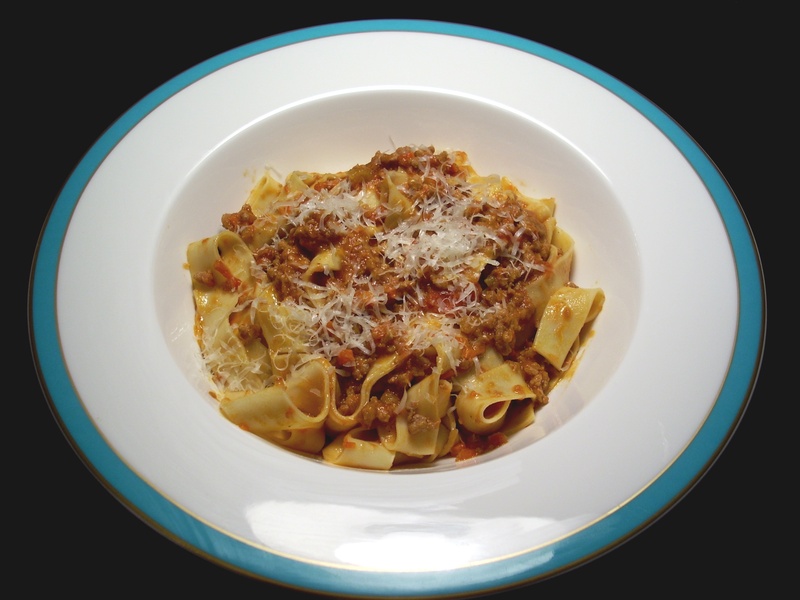 If you have fresh egg pasta (fettuccine, tagliatelle, pappardelle), Bolognese sauce is the way to go. You can even use this sauce in lasagna if you like. It’s a rich sauce that is easy to get going, all you need to do is let it sit and simmer for a couple of hours then cook your pasta. Try this recipe with beef first then try it again with veal. I find the veal sauce is lighter and sweeter than the beef one. And if you’ve got some truffle salt, use it in this. Either way, add some fresh bread, a little parmigiano-reggiano, a bottle of red wine, and you’re in for a great tasting dinner! You should be able to get 4 servings from this recipe. Put a heavy bottomed pan/dutch oven on a med-high heat burner. Add the butter and olive oil. When the butter has melted add the onions and cook until softened about 5 minutes. Next add the carrots and celery. Cook for about 5 minutes more. Add the diced pancetta to the onion/carrot/celery mix and cook for 5 more minutes. Push the mixture off to the side of the pan and brown the ground beef in small batches. (If you need more room just remove the vegetables/pancetta from the pan and set aside in a bowl). Add ¼ to ⅓ of the beef, brown and push off to the side with the vegetables/pancetta. When done browning all the meat spread the mixture back around the pan. Pour in the C of white wine and deglaze the pan. Bring to boil. Next add the C of water (or some stock if you like). Bring to boil. Stir in the C of milk next and bring to boil. Stir in the tomatoes, season with salt to taste, and add nutmeg. When it boils reduce heat to medium, medium low, cover and allow to simmer for 2 to 2 ½ hours. Boil water and cook your pasta. Add drained pasta to ragu and toss to coat. Plate individually or onto a platter for family style service, garnish with parmesan and serve. Looks fantastic and it is perfectly cooked – the longer the better. Thanks! I agree on the longer the better. Sometimes I think that too, but then I don’t think I’d enjoy cooking as much as I do if it were my calling!